Did you play tug of war when you were a kid? When we played at my school they would tie a red bandana in the middle of the rope to indicate the center. The goal was for those on the left and right to pull as hard as they could to drag the red bandana over the finish line for a victory. Politically speaking, most people in the West feel like that red bandana. Every election season, a predictable pattern emerges. Some people run to the rope and pull to the left, and others run to the rope and pull to the right. In the middle are perhaps the majority of people who feel like that red bandana, getting pulled back and forth until they are drug over a line to cast their vote. Division means literally two visions. Where two visions co-exist, division always exists. In various cultures, particularly in the west with the political left and right, these two visions are the fault line over which there is constant division. Pulling on the left, the view of human nature is that we are basically good and evolving with the corresponding vision of creating institutions. This starts with government agencies and non-profits that harness, channel, and release the goodness of human nature. Pulling on the right, the view of human nature is that we are basically bad and broken, with the corresponding vision of creating institutional restraint with such things as cops, jails, and wars. For the Christian, this leads to a difficult conflict as a citizen of an often ungodly government in a largely ungodly culture. On one hand, we believe that people were made in the image and likeness of God and can be born again. We are remade as new people by meeting Jesus, which gives us hope for change and to live better lives. On the other hand, we believe that most people never meet Jesus, only have an old nature, and that even Christians are still sinners who can be driven by sin and selfishness. Hence, we feel the political tug of war personally. The question persists, how should Christians engage with the rulers and systems that dominate our public life? Three thousand years ago, the world’s wisest man and most dominating king gave us one answer – with wisdom. In Ecclesiastes 8:2-6, Solomon gives us wise counsel to navigate living under earthly authority while living under God’s authority. God works through authority. This is why in the Bible we hear a lot about kings who wield political authority, and prophets and priests who wield spiritual authority. This is also why we hear about Jesus submitting to the Father’s will throughout his life, and the constant encouragement for citizens to respect their governmental rulers, wives to respect their husbands, children to honor and obey their parents, and employees to work wholeheartedly for their employer. How does this sound to you? Does this sound right and good, or wrong and bad? Respect for authority is perhaps less popular and fashionable than at any time in the history of the world. I cannot think of any major movement on social media today gaining steam among young people that is based upon personal restraint and respect for authority. Add to this the American fact that our nation was birthed in revolution to overthrow authority. Also, the fact that I am a Protestant was another revolution to overthrow authority, and the pull of the proverbial rope is not toward respect, honor, and submission to authority. It is popular for sinners who are selfish and sinful to rebel against authority by declaring authority to be selfish and sinful, as if either side has the moral high ground. Solomon gives us five points of wise counsel for interacting with rulers – be they in our home, at our job, in our church, or over our government. One, honor God in all that you do. If you believe that godliness is important, then ungodly means do not vindicate the pursuit of allegedly godly ends. Two, remember that the power that those in authority wield is real and often God-given. They can divorce you, fire you, discipline you, fine you, or incarcerate you. Fools get all worked up and forget this only to run headlong into the firing squad. Three, pick your battles prayerfully. Not every hill is worth dying on. Not every cause is equally just. And if you are the kind of person always in search of some cause or conflict, you need to spend a season focused internally on what is wrong with you before you keep plowing forward to change the world externally. Four, do not participate in ungodly plots and schemes. If the mob is forming, don’t go running out to the shed to grab your pitchfork. Never forget, it was Judas who showed up with the mob. Those of you who are young, idealistic, cause oriented, and online a lot need to take this to heart. Five, look for the God given time and process by which to do the right thing, in the right way, at the right time, for the right reason. In the home, on the job, at the church, and in the government look for a godly way provided by God to work for the change that you believe is right. Until or unless that change happens, do not take matters into your own hands in an ungodly manner. Historically, the Civil Rights Movement in the U.S. is one example of working to oppose an injustice and seek change without using wickedness to overthrow wickedness. Practically speaking, if you are an abused wife, then call the police and work through the legal channels that are available. If you are an employee who is being treated unfairly by your boss, you can work through the chain of command or go find another job. If you do not like something your government is doing, you are free to work through the legal channels of free speech and political engagement for change. If God himself, the Lord Jesus Christ, could live under the rule of the godless Roman Empire, even paying his taxes with coins bearing the emperors face as a god, there is good reason for us to find a way to work under the rulers over us. But, if you dishonor God, ignore the authority you are up against, plot and scheme with ungodly people, and rush ahead at the wrong time in the wrong way, even if you bring about change, it will not be godly. It will not be life giving or any better than the very thing you raged against. It’s a lot easier to break something than it is to build something. This is why any old fool can do household demolition by swinging a sledgehammer, but it takes real skill for a finish carpenter to build something in its place. There are things in this life that we want to change, or even need to change, but we cannot change them. In fact, no person can change them. There are things in this life that only God can do. In 8:7-9, this is the point that Solomon is driving at – that things such as the knowing what tomorrow holds for us, when we will die, or what nature will do are in God’s hands and out of our hands. There is simply a lot of things that no matter who is in charge, there is nothing they can do about them. However, we do need to trust God to rule over all. God alone has authority and control over everyone and everything. In this life, as Solomon says, people use their power to hurt and harm one another. This includes the person sitting on the throne ruling over their family, business, church, courtroom, or government – and their critics standing around throwing rocks at them. But, one day every throne will be gone forever and only one throne will remain. Sitting on that throne will be the risen, ruling, reigning King of Kings and Lord of Lords – Jesus Christ! He will judge the living and the dead and on that day, before the Judge who sees and knows all, wickedness will not be rewarded. This includes the wickedness of those in power, and the wickedness of those under their power. Subsequently, 8:10-14 focuses on the need to keep our heads, do our best for justice in this life by seeking it in just ways, and trusting our just God to do his part in this life and the life to come. This world is filled with injustice. Sometimes, this injustice benefits us so we don’t even mind it. Rarely do we feel passionately about injustice until it hits our life, or the life of someone we love. Then, we find ourselves emotionally frustrated and invested. As we lift our eyes up from our little life to survey what is really going on in this world we see the same thing that Solomon does. Wicked people get big funerals where people stand up and say nice things about them that are not true. Evildoers get praised in houses of worship. Criminals get away with their crimes, which only encourages more criminals to commit more crimes. Sometimes the most evil people live the longest lives. To make matters worse, sometimes the good people are vilified, and the bad people are vindicated. Solomon says this is all “so meaningless!”. Anyone paying attention and keeping score has to wonder why they should not live an evil life filled with sin and selfishness if they can get rich, be praised, live long, and prosper. Solomon says the key to keeping our head on straight and heart right is to “fear God”. The difference between an ungodly life and a godly life is to remember and not forget God. God’s justice may be delayed as he waits for sinners to repent, but it will not be denied. Those who persist in sin without ever turning to the Lord Jesus are not getting away with anything. Instead, they are stacking up everything for a brutal sentencing to an eternal hell. This theme of fearing God is crucial to understanding Ecclesiastes. 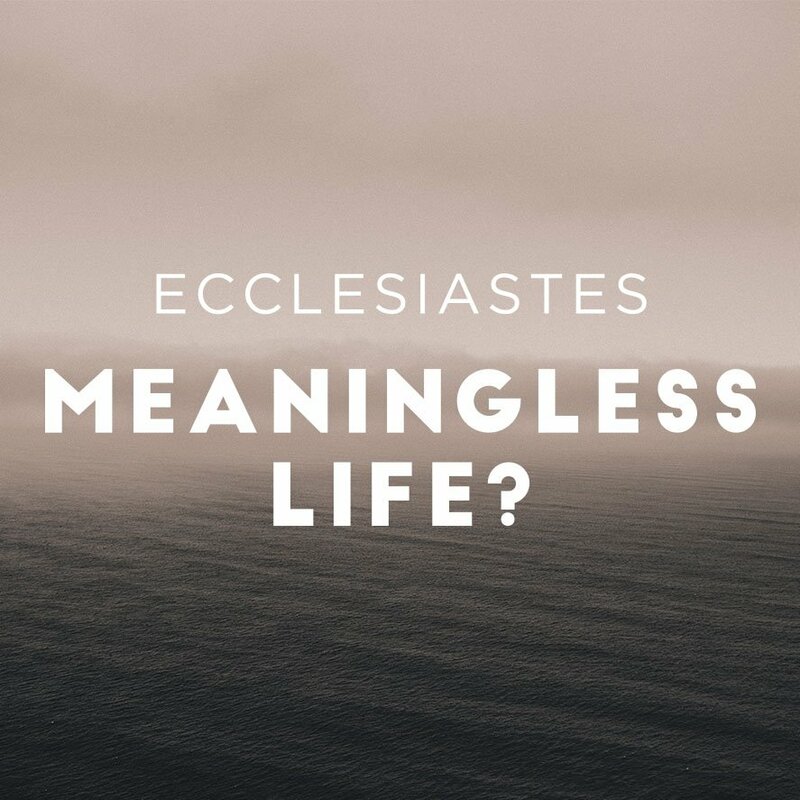 Roughly five times the book returns to this theme – with the two major occasions being here in Ecclesiastes 8, as well as the final chapter. The point is that life “under the sun” makes no sense if there is not a final judgment before God for all people. However, if there is a final judgment and eternal sentencing, then the “fear of God” enters into this life and we are urged to consider all we do in light of that day in court before Jesus Christ. To use an analogy, if there were no police or prisons in this world, you would likely live differently than if you knew that the police were keeping an eye on you and had the authority to sentence you to prison if you broke any laws. The Bible portrays Jesus like a sheriff riding into the world on a white horse to bring an end to wickedness. On that day, Jesus will round up the rebels, and have them drug into his court. There, he will preside over them from a White Throne. Many will be sentenced to his eternal prison of hell. Justice comes through Jesus. It comes through his cross where he died in our place for our sins. Or, it comes through his white throne where we die in our place for our sins. Either way, justice comes and those who deny this will be tragically sorry when the Sheriff rides into town. The wise person knows that God is a judge who metes out eternal sentencing, whereas the fool denies this fact. During this life where injustice occurs, it looks like the fool is correct. But, that is only an illusion – one that is crashed at the judgment seat of Christ. This leads to a fear of God that is reverential, emotional, practical, and worshipful because the end of this life is the beginning of our eternal life, and forever is a long time. In the meantime, we are to enjoy life from time to time, according to 8:15. Until the final judgment, we are encouraged to have fun, eat something good, drink something tasty, and make some memories by enjoying life. Life is filled with injustice, frustration, and work to be done. We should work for justice, but, we also need to not become so obsessed, driven, and serious that we lose sight of the goodness of God and greatness of His coming kingdom. Some people are so dour that they accomplish a lot but live very little. Are you one of those people who can get so upset by injustice in your life, someone else’s life, an organization, or political system that it has you obsessed? Here’s an invitation from God the Father who loves you – find something that is not ungodly that you enjoy, and go do it once in a while. Take a break, clear your head, purify your heart, visit your friends, enjoy your family, and practice for the kingdom when all will be well forever. Do you lean to the political left or right? What authority has God placed over you? What injustice(s) in this world frustrates you the most? What example(s) can you give from your own life where you failed to fear the Lord for a season or in a situation? Can you give any example of an injustice you have experienced that you had to just trust the Lord to work out because it was out of your hands? How good are you at having fun, enjoying life, and not being serious all the time?